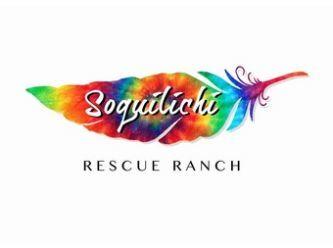 A small not for profit no kill rescue, Soquilichi Rescue Ranch mainly focuses on saving unwanted dogs, puppies, kittens & their mothers versus negative outcomes... Providing a voice and a second chance to those who need it most. It all about finding the right homes and making sure that the animals are shown the love, respect and given the security they deserve. 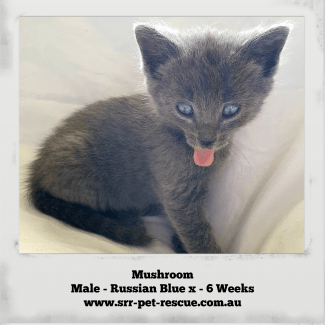 Location Eudlo Name - Mushroom Breed - Russian Blue x Colour - Blue Age - 6 Weeks Gender - Male Desexed - Yes Vaccinated - Yes Vet Checked - Yes Microchipped - Yes Good with Cats - Yes Good with Dogs - Yes Good with Children - Yes Hi!! My namez Mushrooooom. My foster family tell me I'm a very handsome man. I have fluffy, fluffy, all grey fur and I always make sure to look my best. I love to play with my foster family before I fall in a heap on their lap to sleep. I do love to snuggle! Ready in 2 Weeks Mushroom will make the perfect addition to your family. 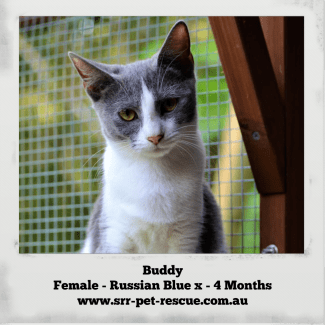 to find out more please contact Katrina on 0405 156 059 or find us on facebook "Soquilichi Rescue Ranch"
Location Yandina Name - Buddy Breed - Russian Blue x Colour - White and Blue Age - 4 Months Gender - Female Desexed - Yes Vaccinated - Yes Vet Checked - Yes Microchipped - Yes Good with Cats - Yes Good with Dogs - Yes Good with Children - Yes I am a funky little guy that is first to greet you at the door to the cat enclosure. Kitty's my age shouldn't be in an enclosure. I should be in your arms. Buddy will make the perfect addition to your family. 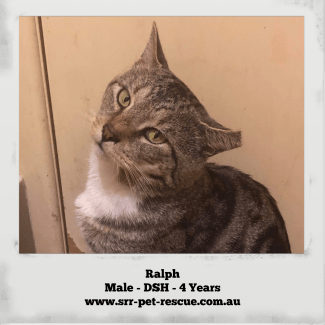 to find out more please contact Katrina on 0405 156 059 or find us on facebook "Soquilichi Rescue Ranch"
Location Bribie Island Name - Ralph Breed - Domestic Short Hair Colour - Tabby and White Age - 4 Years Gender - Male Desexed - Yes Vaccinated - Yes Vet Checked - Yes Microchipped - Yes Good with Cats - Yes Good with Dogs - No Good with Children - No Meet Ralph. Ralph is a quiet bloke. He definitely likes the quiet inside life.while He isn't nasty to other cats he would much prefer to be a lone cat or a small numbered household. He's a chill sorta guy, happy to have his dinner and find a comfy spot to snooze. Learning to trust humans - once he knows you don't mean him harm he lives his pats. Ralph hit on hard times but he will be a big boy now he has regular meals and TLC. Ralph will make the perfect addition to your family. 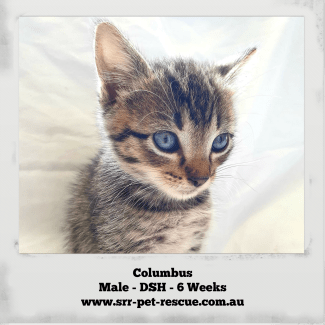 to find out more please contact Katrina on 0405 156 059 or find us on facebook "Soquilichi Rescue Ranch"
Location Eudlo Name - Columbus Breed - Domestic Short Hair Colour - Tabby Age - 6 Weeks Gender - Male Desexed - Yes Vaccinated - Yes Vet Checked - Yes Microchipped - Yes Good with Cats - Yes Good with Dogs - Yes Good with Children - Yes This guy! Named after Christopher Columbus, this little adventurer can be found... wait, where is he?!? Running around and jumping over imaginary hurdles is among favourite things to do. He's often the one to start the game of roughins and let's me know when it's time to get out of the enclosure for a play. When the adventures are over with and it's time to turn off our imagination, he turns into the most beautiful ball of snuggles. Columbus is not a needy cat, but will let you shower him with affection if you're willing (after playtime obviously). Ready in 2 Weeks Columbus will make the perfect addition to your family. to find out more please contact Katrina on 0405 156 059 or find us on facebook "Soquilichi Rescue Ranch"
Location- Warana Name - Hugo Breed - Domestic Short Hair Colour - Ginger Age - 4 Months Gender - Male Desexed - Yes Vaccinated - Yes Vet Checked - Yes Microchipped - Yes Good with Cats - Yes Good with Dogs - Yes Good with Children - Yes Hugo is by far one of the most charming and affectionate little kitties you will meet! With endless purrs and head butts to give, Hugo just wants to be loved 😍 He will even follow you around the house like a little ducking just to be with you. 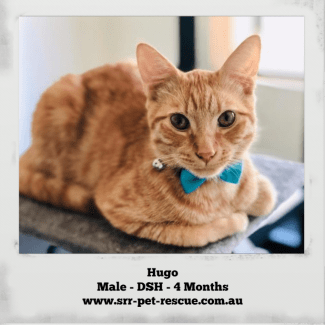 Hugo will fit into any type of household with ease. Hugo will make the perfect addition to your family. to find out more please contact Katrina on 0405 156 059 or find us on facebook "Soquilichi Rescue Ranch"